The AgustaWestland CH-149 Cormorant is the Canadian Forces designation for the AgustaWestland AW101 (formerly EH101), a helicopter used for air-sea rescue in Canada. Developed as a joint venture between Westland Aircraft in the UK and Agusta in Italy (now merged as Leonardo), the CH-149 is a medium-lift helicopter for military applications. In 1977, the British Ministry of Defence issued a requirement for an anti-submarine warfare (ASW) helicopter to replace the Royal Navy's Westland Sea Kings. Westland responded with design WG.34 that was approved for development. Meanwhile, the Marina Militare (Italian Navy) was also seeking a replacement for its (Agusta-built) Sea Kings, leading Agusta to discussions with Westland about the possibility of a joint development. This culminated in the joint venture being finalised in November 1979 and a new company (EH Industries) being formed to manage the project the following year - EH being an abbreviation for Elicottero Helicopter the English and Italian words for "helicopter." As the design studies progressed, EH became aware of a broader market for an aircraft with the same capabilities required by the British and Italian navies, leading to a more generalised design that could be customised. After a lengthy development, the first prototype flew on October 9, 1987. Following the lead of the UK and Italy, the Canadian government placed a C$4.4 billion order in 1987 for 48 (later 42) EH101s to replace the Canadian Forces's Sikorsky CH-124 Sea Kings and Boeing Vertol CH-113 Labradors. These were to be assembled in Canada under the designations CH-148 Petrel (33 originally, reduced to 28) and CH-149 Chimo (15) in the anti-submarine warfare and air-sea rescue roles respectively. The replacement programme was cancelled, however, after a change of government in 1993, leading to the payment of $157.8 million in cancellation penalties. In 1998, the Canadian government announced that the CH-113s would now be replaced by a new scaled down search-and-rescue variant of the EH101, carrying the designation CH-149 Cormorant. Unlike the Petrel/Chimo contract, these 15 aircraft were to be built entirely in Europe. The first two aircraft arrived in Canada in September 2001 and entered service the following year. When it became obvious that the Sea Kings were in need of immediate replacement, the EH101 was again part of a Canadian competition (Maritime Helicopter Project), against a variant of the Sikorsky H-92, for a total price tag of C$5 billion. The Sikorsky entry won the competition on July 23, 2004, with the first six delivered June 2015. The first operational CH-149 flight occurred in 2002 when a Cormorant of 442 Squadron performed a medical evacuation from a merchant ship 200 km (110 nmi) offshore in Hecate Strait. An even more dramatic demonstration of Cormorant capabilities occurred in late 2002 when a 103 Squadron CH-149 successfully flew a 1,200 km round-trip rescue mission to a container ship off Newfoundland. Two refuelling stops at the Hibernia oil platform were required. In August 2010, the Canadian Forces fleet of 14 CH-149 Cormorants passed 40,000 operational hours. The fleet had a higher flying rate than any other AW101 fleet and Cormorant 901, currently stationed at Canadian Forces Base Comox with 442 Squadron, has the highest number of airframe hours on any of the AW101s anywhere in the world. The worldwide fleet of 190 AW101 helicopters had achieved in excess of 200,000 flight hours in Canada, UK, Italy, Denmark, Portugal, and Japan. In June 2011, several former USN VH-71s, which are also based on the AW101, were purchased by Canada to be used as spare parts for the CH-149 fleet. In 2013, Canada was reportedly studying whether up to four of the VH-71s could be certified for operational use. In 2017, the Liberal government announced funding for the mid-life upgrade of the fleet, to be led by 'Team Cormorant', a team composed of Leonardo Helicopters and IMP Aerospace and Defense. Estimated at around C$1.5bn, the programmes will offer a common fleet featuring latest avionic and mission systems, advanced radars and sensors, vision enhancement and tracking systems as well as a new 3,000 horsepower (2,200 kW) GE CT7-8E engine. On May 10, 2017, a report by the Senate Standing Committee on National Security and Defence recommended the government move forward with a proposal to expand the Cormorant fleet by upgrading the 14 CH-149 aircraft and converting seven VH-71 airframes currently in storage to the same operational capability. This would expand the Cormorant fleet to 21 aircraft, and keep them operational until 2040. All of the upgraded helicopters are expected to be delivered by 2024. Upon its entry to service, the AW101 experienced tail rotor hub cracking issues; including one British Merlin crashing on 30 March 2004 which was caused by this issue. The CH-149 Cormorant has been grounded and been placed on limited flight status multiple times due to hub cracks; all 15 aircraft in Canadian inventory showed cracks of varying degrees shortly after entry to service in 2004. A subsequent redesign was issued in 2005; out of the six aircraft which had the new hubs installed, three showed cracking one month later. A new Articulated Tail Rotor (ATR) with elastometric bearings has been adopted on the AW101, based on a proven design used on the AW139 medium-twin helicopter. The ATR is now standard issue on new AW101s and is offered for retrofit on existing fleets. On 13 July 2006, a CH-149 of 413 Transport and Rescue Squadron crashed into the waters of Chedabucto Bay off the coast of Canso, Nova Scotia while flying in heavy fog during a search and rescue exercise with a Canadian Coast Guard Auxiliary vessel. Three Canadian Forces personnel were killed and four others were injured. Mechanical failure was formally ruled out as the cause of the crash. On 11 March 2008, the Directorate of Flight Safety for the Canadian Forces announced that pilot error was the cause, and that Canadian Forces officials were aware of a lack of training received by pilots. Preliminary reports indicate that pilots were unaware of the proper use of the autopilot, leading to a controlled flight into terrain. ^ "Canada Settles Claim On Canceled Helicopters". New York Times. New York City. January 24, 1996. Retrieved January 23, 2015. ^ "CH-148 Cyclones delivered to Halifax airbase". cbc.ca. 19 June 2015. Retrieved 22 September 2015. 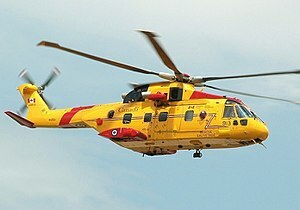 ^ "Canadian Forces' Cormorants pass 40,000 Operating Hours | ca.agustawestland.com". 2015-09-23. Archived from the original on 2015-09-23. Retrieved 2018-03-23. ^ Pugliese, David (16 June 2011). "Obama's choppers purchased for parts for Cormorants". Victoria Times Colonist. Archived from the original on 2011-06-30. ^ "Barack Obama's discarded helicopters could fly in Canada's air force". Toronto Star. 5 May 2013. Retrieved 26 November 2014. ^ "Leonardo and IMP to modernise RCAF's CH-149 Cormorant SAR helicopter fleet - Airforce Technology". 30 May 2017. ^ "Cormorant, Griffon upgrade projects get new lift - Skies Mag". ^ "103 Search and Rescue (SAR) Squadron". rcaf-arc.forces.gc.ca. Archived from the original on 17 May 2013. Retrieved 3 April 2013. ^ "413 Transport and Rescue Squadron". rcaf-arc.forces.gc.ca. Archived from the original on 22 May 2013. Retrieved 3 April 2013. ^ "442 Transport and Rescue Squadron (TRS)". rcaf-arc.forces.gc.ca. Archived from the original on 17 May 2013. Retrieved 3 April 2013. ^ "Flying restrictions after crash". BBC News. 6 April 2004. ^ Canada Strives To Fix Cormorant’s Tail Cracks. DefenseNews.com, 2 June 2006. ^ "CTV News - Top Stories - Breaking News - Top News Headlines". ctv.ca. Retrieved 22 September 2015. ^ "Inadequate training behind Cormorant crash | CTV News". 2012-10-15. Archived from the original on 2012-10-15. Wikimedia Commons has media related to Canadian Air Force CH-149 Cormorant. This page was last edited on 11 April 2019, at 08:17 (UTC).